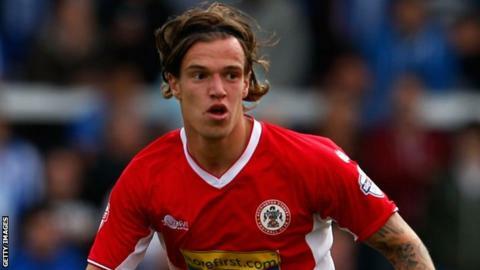 Accrington squandered a two-goal lead as Luton fought back to earn a draw. All four goals were scored in the first half, with the opener coming from the hosts' James Gray, who slid in. Stanley captain Luke Joyce doubled the lead as his header bounced in off the post before the Hatters pulled one back through Luke Rooney's curling shot. Luton levelled as Jake Howells' deflected free-kick wrong-footed the keeper and despite an open second half neither side could find a winner. The draw for James Beattie's Accrington was their first point of the season, while Luton's first season back in the Football League since 2009 has seen them pick up five points from four games. "I felt that our general play in the second half meant we deserved to win the game, but I think we were quite rightly behind. "We battled back well, but it's not good enough. I think the players are aware it wasn't good enough. Our approach to the game wasn't as disciplined or professional as we usually are and I'll have to look into that. "Luke Rooney can come up with the unpredictable sometimes and I like that in a player, particularly attacking players, but his all-round game wasn't that consistent. "We want to win. But we won't win by giving goals away, and we're not a team that gives goals away." Match ends, Accrington Stanley 2, Luton Town 2. Second Half ends, Accrington Stanley 2, Luton Town 2. Attempt blocked. Tom Aldred (Accrington Stanley) header from the centre of the box is blocked. Corner, Accrington Stanley. Conceded by Mark Tyler. Attempt saved. James Gray (Accrington Stanley) left footed shot from the left side of the box is saved in the top left corner. Robert Atkinson (Accrington Stanley) wins a free kick in the defensive half. Substitution, Accrington Stanley. Marcus Carver replaces Nicky Hunt. Attempt missed. Matt Robinson (Luton Town) right footed shot from outside the box misses to the right. Attempt missed. Luke Wilkinson (Luton Town) right footed shot from more than 35 yards is high and wide to the right. Attempt saved. Jordan Mustoe (Accrington Stanley) left footed shot from outside the box is saved in the centre of the goal. Foul by Nicky Hunt (Accrington Stanley). Jordan Mustoe (Accrington Stanley) wins a free kick in the defensive half. Attempt missed. Josh Windass (Accrington Stanley) right footed shot from outside the box misses to the right. Paul Connolly (Luton Town) wins a free kick in the defensive half. Substitution, Luton Town. Alex Wall replaces Mark Cullen. Attempt saved. Matt Robinson (Luton Town) right footed shot from outside the box is saved in the top centre of the goal. Corner, Accrington Stanley. Conceded by Andy Drury. Attempt saved. James Gray (Accrington Stanley) right footed shot from the right side of the box is saved in the top centre of the goal. Attempt missed. Paul Benson (Luton Town) header from the centre of the box is close, but misses to the left. Andy Drury (Luton Town) wins a free kick in the defensive half. Foul by Jordan Mustoe (Accrington Stanley). Attempt missed. Josh Windass (Accrington Stanley) right footed shot from the centre of the box is close, but misses to the left. Corner, Luton Town. Conceded by Robert Atkinson. Attempt saved. Luke Rooney (Luton Town) right footed shot from the left side of the box is saved in the bottom right corner. Attempt saved. Jake Howells (Luton Town) right footed shot from outside the box is saved in the centre of the goal. Substitution, Accrington Stanley. Josh Windass replaces George Bowerman. Attempt saved. Andy Drury (Luton Town) right footed shot from the right side of the box is saved in the top centre of the goal. Corner, Luton Town. Conceded by Adam Buxton. Attempt missed. Kal Naismith (Accrington Stanley) header from the centre of the box is too high following a corner. Corner, Accrington Stanley. Conceded by Jake Howells. Attempt saved. Luke Guttridge (Luton Town) left footed shot from outside the box is saved in the bottom right corner.